The 17th hole at TPC Sawgrass has an aura all its own. Part of that aura is the fact that the spectators watching the island green are often loudest when the worst of shots happen. See Tiger Woods and his two water balls on Friday. 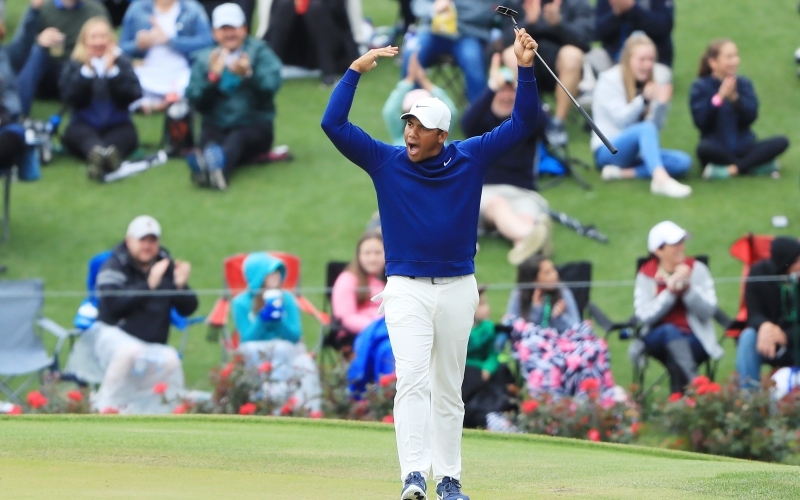 But on Sunday afternoon, those gathered around the 136-yard par 3 were treated to some of the most amazing theatrics you could wish for—and these ones were all for the good. It began with this improbable putt by Eddie Pepperell, the Englishman in the midst of a crazy back-nine run en route to a 66 and a share of the clubhouse lead (at the time) at 14 under. Pepperell had 49 feet, 7 inches for his fifth back-nine birdie in seven holes. And well … take a look. 5️⃣0️⃣ feet from @PepperellEddie at the iconic 17th! He's tied for the lead @THEPLAYERSChamp. Could you ever top that putt? Well, apparently you could. As Jhonattan Vegas would demonstrate only one group later. The longest putt on 17 … EVER. The folks on the NBC broadcast said it was 72 feet. ShotLink is showing it as 69 feet, 7 inches. Either way, it’s the longest putt ever holed in the Players Championship on the 17th at Sawgrass since they became officially measuring putts in the ShotLink era. The previous mark: Bernhard Langer has holed a 59-foot, 9-inch putt back in 2008. That was the sixth birdie of the day for Vegas as well, who finished with a 66 to get to 14 under as well. Few will ever forget the “Better than most” putt from Tiger Woods in 2001. And Pepperell and Vegas won’t be the winners here this year at Sawgrass. But these two putts deserve their own special place in the lore of the 17th.